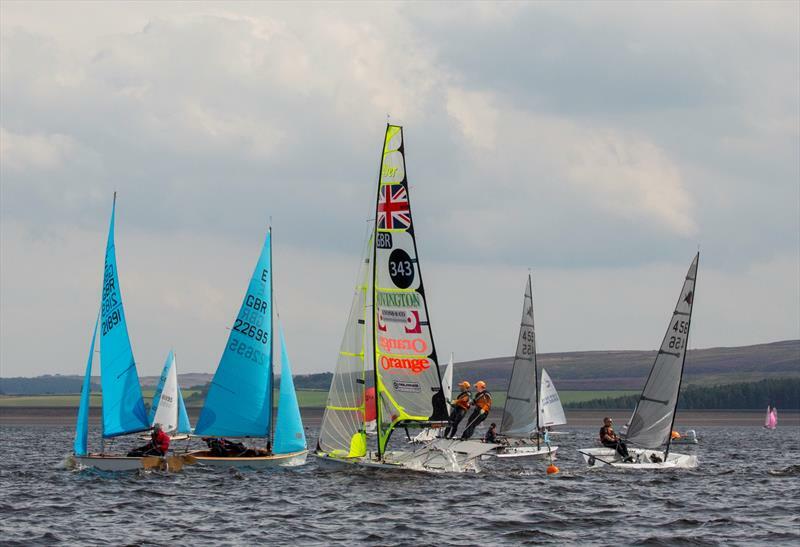 The 2016 Travellers Series consisted of 7 events with 4 to count, at least one of which had to be the Inlands(Chase), Nationals(Llandudno) or Ovington Championships(Grafham). 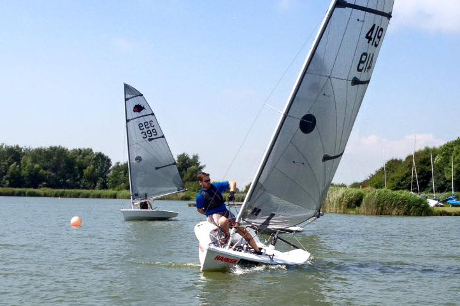 Most of the events experienced light to moderate winds, except Grafham where it blew over 30 knots. Christian's string of bullets comfortably gave him the series. It was windy, and just 4 races were held with 3 to count. Christian was consistently first, Kevin would have been second had he launched on the Sunday. 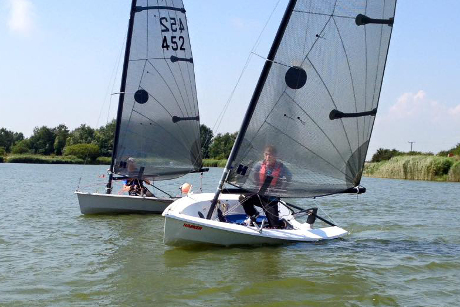 Ross sneaked ahead of Kevin by virtue of sailing 1 race on the Sunday. Sam also only sailed on Saturday and rounded off those who started. A couple of others ventured out but took up swimming and never started. 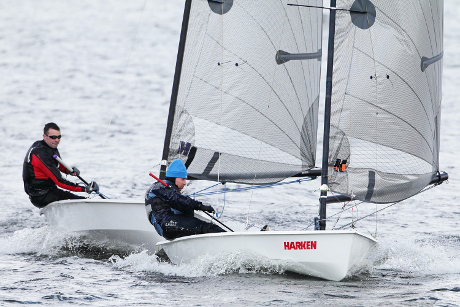 15 boats attended the 2016 Inland Championships at Chase SC this year, although 17 sailors took part in the racing with Solutions 404 and 416 being loaned by other Chase members for the second day of racing. Race 1 - Saturday morning brought a light shifty breeze from the South which offered the RO the best option for getting the longest beat out of the reservoir. The 15 boats all lined up on a nice short square line, and even though 2 boats were over at the gun the rest started working their way up the challenging beat, trying to avoid the odd weed patch whilst looking for better breeze. Christian Smart (405) led the way with (me) Ross Prytherch (438) and Jack Turnbull (419) in hot pursuit. Christian then managed to get ‘weeded’ up and Jack and I pulled about 200m ahead, with Katherine Clark (455) and Leslie Jeaves (446) also passing Christian on the reach. Jack and I had a great battle, Jack tending to get the better of me upwind and then I would gain down-wind. While I was fending off Jack, Christian had now de-weeded and on the next lap he was closing in again... I covered everything but the kitchen sink up that beat and with about 50m to go Christain managed to squeeze past Jack for second place and got within 5 boat lengths of me... but I did it, my first even win in a Solution Open event, well chuffed!! Katherine and Leslie held onto fourth and fifth respectively. 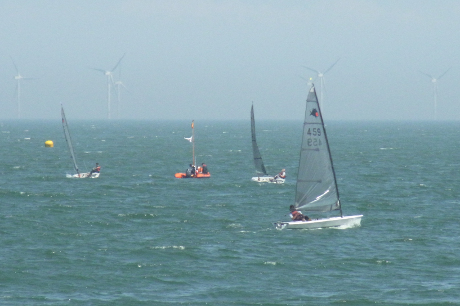 Race 2 – The wind shifted to the right so a different course was required. Clean start this time and all was good at Mark 1, but then it went pear shaped at Mark 2… The leaders, Christian and Jack could not remember which way to round the Mark! They had a brief conversation about this dilemma whilst about 5 boat lengths from the mark and then Christian duly took the easiest option which was to round it to Port at that time. 6 boats followed him…! Whilst rounding last said mark Ross and Paul Nix (440) got tangled up which resulted in Paul, (now known as ‘Basher Nix') having to do turns which put him out of the lead pack. Meanwhile Katherine being the clever one in the fleet was now rubbing her hands, as Katherine had written the course down. So although everyone at the front carried on racing they were unknowingly DSQ’d so the real race was now with Katherine, Peter Fisk (436), Graeme Kerr (430) and Steve Turner (441) and this is the order in which they finished. Race 3 – ‘Basher’ was at it again for the start of this race... trying to take out both Christian and the committee boat at the same time, nearly knocking the RO off the boat. Jack and myself got an early lead but such were the conditions that the whole fleet would catch again down-wind. Christian, Jack and I pulled away again and ‘Basher’ pulled through to fourth with Peter Fisk and Katherine close behind at the finish. Now it was time for a quick scrub and prepare for ‘Curry Night’ – 7pm sharp! The ladies of Chase SC put on a fabulous spread that consisted of Poppadum’s, Samosa’s, Onion Bhajis and 3 Curries that was attended (and greatly enjoyed) by about 60 Sailors and club members in all, and what a fine feast it was! After quite a few alcoholic beverages and the odd Coke (Kev), we were all gently caressed out of the bar by 10:30pm, but in typical fashion Christian had not had enough beer, so invited those that dared, back to his motorhome to polish off his emergency supply of Corona! I fell asleep at some point soon after my fill of Corona, Peter and Leslie slipped off too, back to their beds on wheels, leaving Christian watching TV and half a crate left…. I was then awoken at 7:30am with Christian making Coffee and watching Match of the day… and only 2 bottles left!! Sunday morning brought rain… lots and lots of rain! 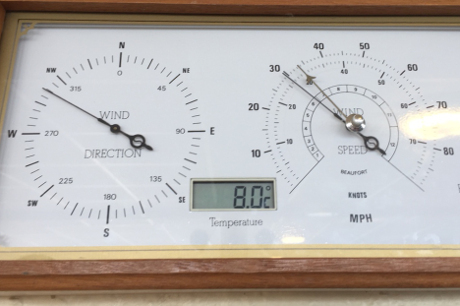 But luckily for us all it cleared by 10am with a bit more breeze, anything from 5-15kts and the shifts were big, very big!! 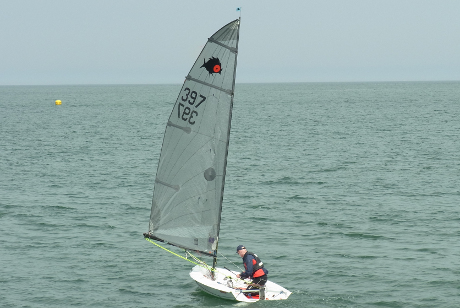 Race 4 – Martin Tubb (456) was tuned in to these fresh conditions and showed great speed out of the blocks with Christian alongside and just managing to get ahead of him at the end of the first beat. Martin was unlucky as he held third position for all but the last half of the last beat, where he took one bad shift and was passed by the ever present and keen Jack into third place with me alongside side him but half a boat length behind... ‘Basher’ Nix and Peter followed with Jo Musson (416) showing good pace in her loaned boat from her father John Cassidy who raced all of day one but was unable to race the second day. Race 5 – A Port end flyer did not quite work for Christian in this race which resulted in him retiring from the race in the end, so it was all go for Jack, Martin and I to get the best out of this. 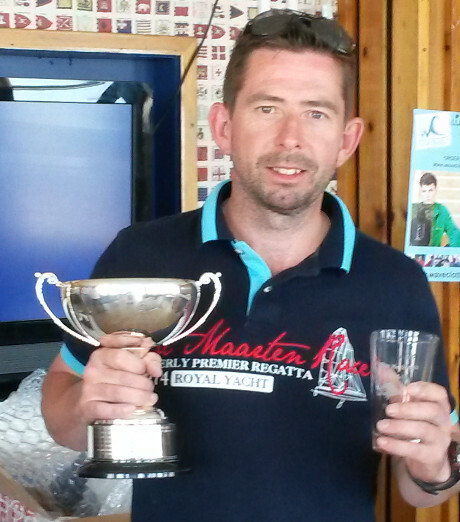 Jo was getting to grips with the boat now and sailed a great race to finish third. Jack took this race with Martin still going strong and getting second. The wind was now starting to build and a few boats were starting to dip their masts in the water, albeit a few said it was just to check for weed...! Sailors started arriving at Derwent Reservoir SC from Friday lunchtime to enjoy the warm weather, rig boats, BBQ and to hear Seven Sins playing in the marquee until late into the evening. Saturday dawned with a light to medium breeze. In the conventional fleet all classes seemed to have their time at the front but the Scorpion of Steve Walker and Jerry Hannabus came out on top, with Sam Davy taking a second place in his Solution. 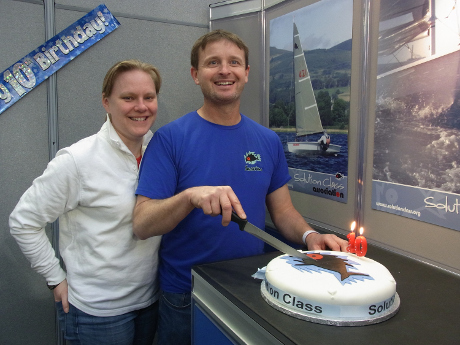 Photo: from the dinghy show but seems appropriate!! On a gloriously sunny day Alan, Jack and Graeme were joined by Graeme Kerr from Henley Sailing Club for the Solution open meeting. With a very gradually building breeze 4 races were held and with a relatively consistent direction the course was kept the same for all of them, which was a bonus for the traveller as there were 8 buoys constituting a lap. The first race was led from start to finish by Graeme Fuller with Jack Turnbull almost keeping him honest in second after a terrible start. Alan Baker and Graeme Kerr were battling closely throughout. After a quick water stop the second race was underway with the slightest shifts making the difference in the battles Jack and Graeme Fuller were switching places right until the last leg where Graeme tacked earlier than Jack who held on and managed to get the shift to overtake and claim victory. 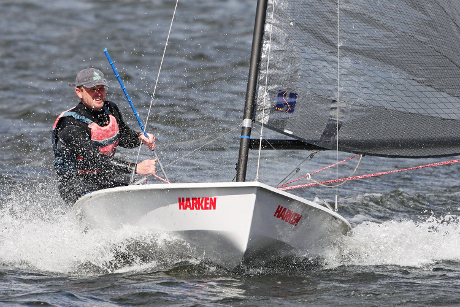 The third race had fractionally more wind which suited Jack Turnbull who managed to lead from the beginning with the 3 following boats all battling and enjoying the sun. The 4th race led a largely similar pattern with the Graeme, Alan and Graeme all getting closer through the day as people tweaked their boats and learnt a few tricks on the lake. A thoroughly enjoyable in beautiful conditions. 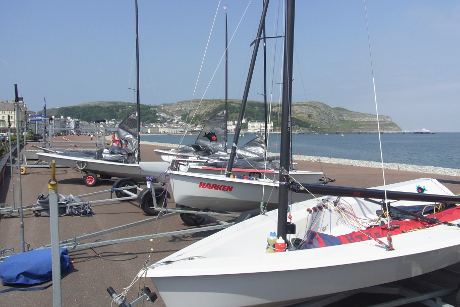 Some Englishmen, an Irishman and some Welshmen (and Kathryn) turned up to Llandudno SC on the weekend of 4/5 June for the 10th Solution National Championships. They were greeted by bright sunshine and temperatures in the 20's. A lack of wind saw Nathan Batchelor and Karl Milford tiring themselves out on paddleboards while the rest of the fleet waited for the breeze to fill in. It appeared on cue allowing the first race to start on time albeit still fairly light which suited the Pembrokeshire contingent. Christian Smart took 3 bullets and Ross Prytherch finally showed the fleet what he is capable of, which led him to take it easy on the beers on Saturday night – something that gave the rest of the fleet cause for concern. 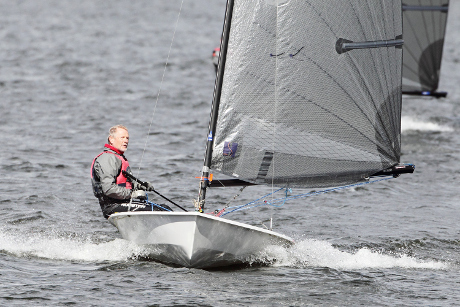 Peter Fisk won the Masters Trophy and Martin Tubb the "Ted Funnell" mid-fleet trophy. 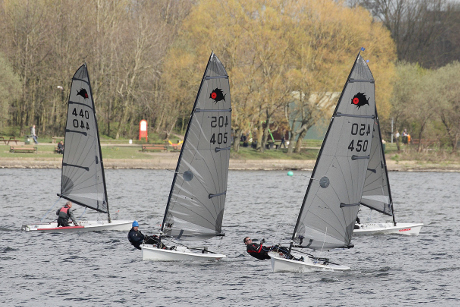 Seven visiting Solution sailors made their way through the snowy countryside on Saturday morning to join one home boat at Leigh and Lowton SC for some cracking sailing in the April sunshine. Christian Smart ran away with the event with a clean sweep of first but that belies the level of competition in the races before he crossed the line. The battle for 2nd, 3rd and 4th shows how closely fought the event was, with final positions going down to the last race. Sam Davy came out on top pushing Kevin Clark into 3rd and local boy Martin Tubb finished 4th. The back end of the fleet wasn't short of competition either though this was more like a case of the tortoise and the hare – sailing conservatively to stay upright versus going for speed and giving the burgee a wash.